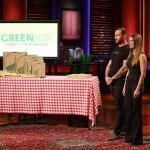 Andrew Feld brings grass, in the form of a grass pee-pad for dogs, into the Shark Tank in episode 616. He calls his product Fresh Patch and it's literally a patch of grass in a box. The idea is to use it as a training tool for dogs, getting them to want to train on real grass instead of synthetic pee-pads or news paper. Feld claims that, by using a real grass pee-pad, dogs won ‘t get conditioned to peeing on synthetic surfaces – which could make for messy, smelly carpets. Dogs love grass; they like running on it, rolling on it, and doing their business on it. Back in 2010, Feld got the idea to deliver hunks of turf to people with dogs so they'd have an all-natural place for Fido to pee. The advantage of a grass pee-pad is the root system absorbs odors and, when the Fresh Patch is saturated, you can palnt it outside or dump in into the compost heap. Feld ships Fresh Patch via FedEx in a recyclable, compostable cardboard box. If you opt for his subscription service, a new patch of grass gets shipped every two weeks. Using a real grass pee-pad is a good idea. An even better idea is selling it: Feld has to be complimented for re-purposing a fairly common item. After all, you can go to any home and garden center and buy a hunk of turf, what Mr. Feld has done is automated the process while educating the dog-owning public about his product. Any half intelligent dog owner will immediately see the benefits of this product. We're having a blizzard as I write this and my dog is afraid to go outside! Offering her a nice, grass pee pad would be most welcome on this day! My dog is all trained up, but it would have been cool to house train her with real grass. I think it's a great training tool and I think Feld is going to see a lot of green after he appears on Shark Tank. Fresh Patch is essentially a logistics business. Feld found a source of grass turf chunks and figured out how to ship it economically. He's made a business out of shipping grass! All that's left for him to do is get the word out and educate the dog-owning public (they'll get it immediately). The one objection he'll face is likely from Mr. Wonderful who'll say he could build this business himself. Kevin won't invest, but one of the other Sharks might. On the Fresh Patch Facebook page, there's a picture of a HUGE load of turf getting ready to be shipped. He also recently re-did his website. Is Feld getting ready for the Shark tank effect or did he do a deal? I think if the numbers are good, he could get an investment. One of these days Robert is going to invest in a dog-related business (he's always petting dogs that appear on the show), maybe this is the one. It's an online sales play and that's right up Robert's alley. I think Fresh Patch gets some green.